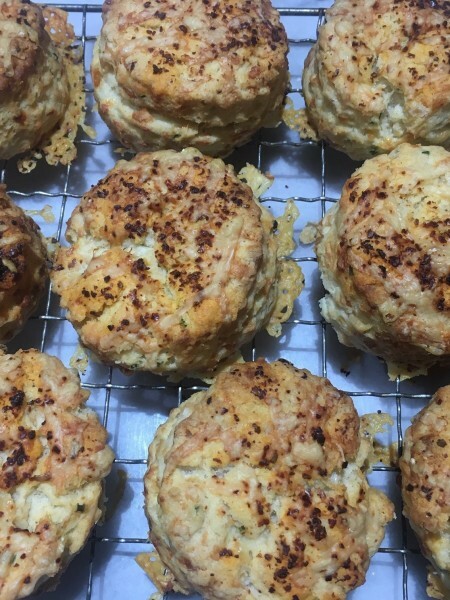 Up until now I’ve had a tricky relationship with savoury scones. My bakes were always disappointing; usually too tough and lacking oomph. I decided to bin the traditional recipes and look to the American biscuit (a sort of scone as opposed to a cookie) for that perfect texture. I figured that what I was looking for lay on the other side of the Atlantic, for an American biscuit has a light and crumbly texture, less doughy than its British counterpart. It might seem strange to pour a carton of double cream into the dry mixture but this keeps the scones feather light. If you can’t find a mature Pecorino cheese use Parmesan in its place. Serve the scones slightly warm, split in half and slathered in butter. 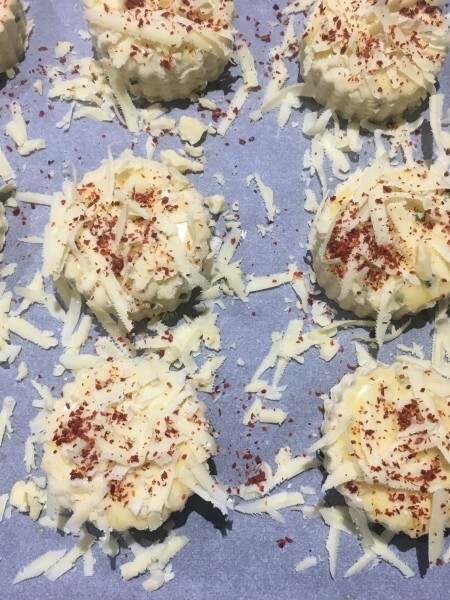 In a large mixing bowl mix together the flour, baking powder, mustard powder, salt, pecorino, 40g of the cheddar and chives. Make a well in the centre and pour in the cream and buttermilk. Mix together gently to form a dough-don’t overwork the mixture or the scones will be tough. Heat the oven to 200˚c, fan oven 190˚c, mark 6. Line a baking sheet with non-stick parchment. Dust a work surface with a little flour. Roll out the dough gently to a thickness of about 2 ½ cm. 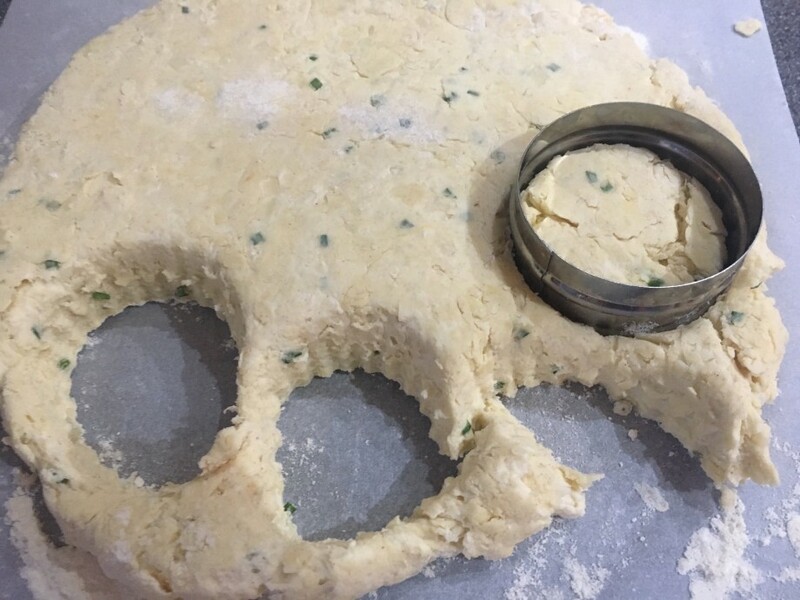 Using a 6cm diameter cutter, stamp out the scones and place on the baking sheet. You can rework the offcuts of the dough and stamp out some more scones but they can be a bit tougher than the first batch. 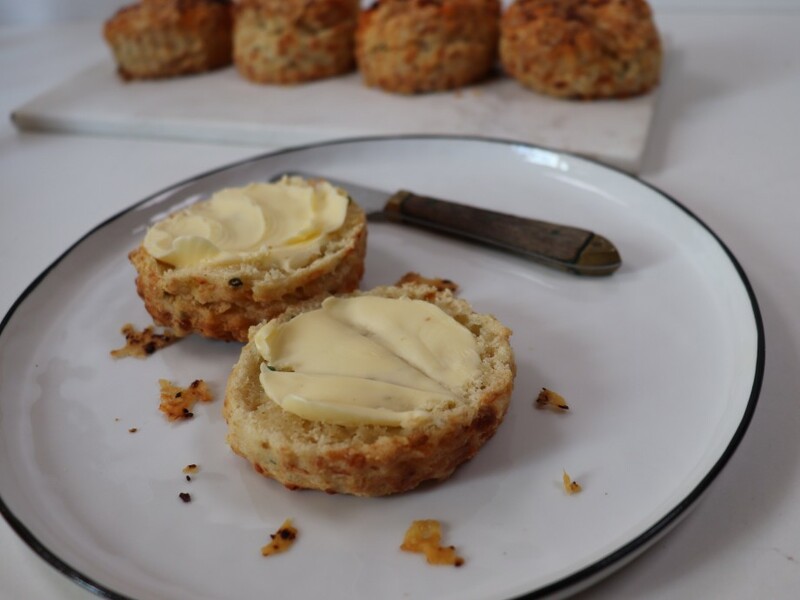 Brush the tops of the scones with the melted butter and sprinkle over the remaining cheddar. Dust with a little Aleppo pepper and bake in the oven for about 18-20 minutes until risen and golden. Transfer to a wire rack to cool.